My Great British Bake Off challenge continues with dessert week, and I decided to try and expand my baking repertoire by attempting meringues. I’ve never made meringue and I’ve yet to see a Bake Off series that doesn’t feature them in some way (this week they poached them as part of the technical challenge. I decided against that! ), so the dessert I made was a summer berry pavlova. My summer berry pavlova was basically just a meringue base topped with freshly whipped cream, a selection of summer berries and finished with a dusting of icing sugar. The result was extremely delicious (if not a little sweet) and I think it’s actually a great showcase dessert for a dinner party as it’s fairly easy to make, the meringue can be done in advance and the toppings added at the last minute, and I thought it looked deceptively impressive! The ratio you need is 2oz caster sugar for every egg white. 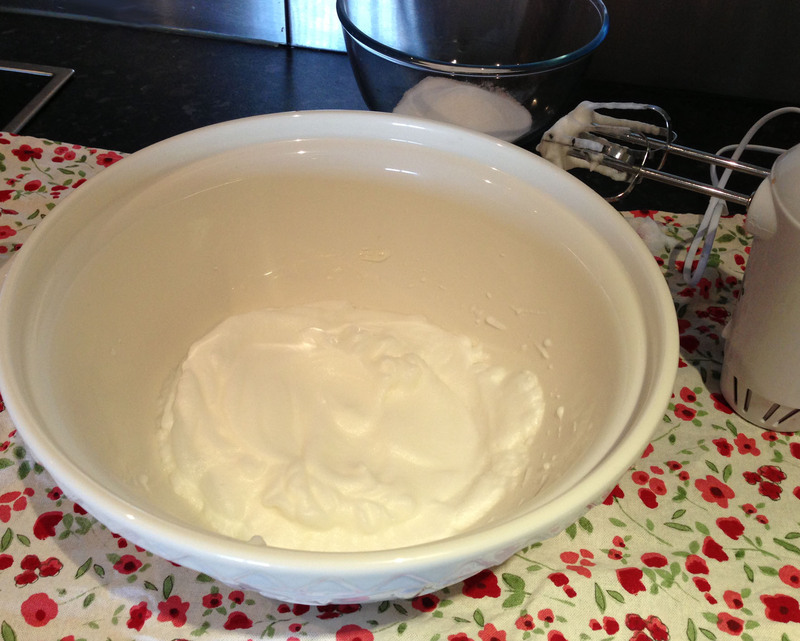 You’ll need to whisk the egg whites into stiff peaks and then add sugar gradually whilst whisking. You end up with a glossy white mixture in the end. You need to avoid getting any egg yolk mixed in with the whites. Apparently it’s a good idea to split the eggs when cold from the fridge, but allow to reach room temperature (takes about 30 minutes) before whisking. Also I read a lot of advice suggesting using a metal or glass bowl. I didn’t get the high stiff peaks I wanted even after whisking for ages! Turns out it was a mistake to take a little break in the middle of the process –which I only did once or twice for a couple of minutes to check my book, but this was clearly not the thing to do! Piping edges onto my base didn’t really work. Even so, my finished meringue was crunchy on the outside and chewy and marshmallow-y on the inside, which is as meringue should be! 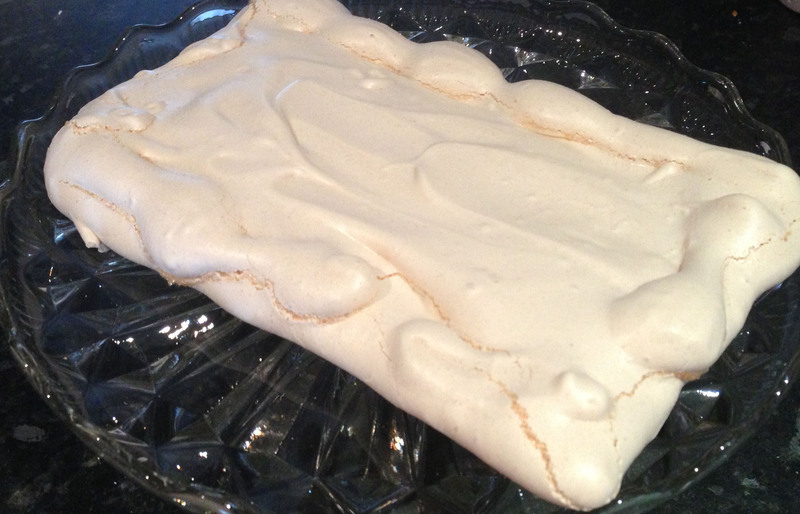 I baked the meringue base on a low temperature (130°C) for 75 minutes and then left it in the oven to cool for several hours after, which allowed it to fully dry out. I didn’t add the toppings until I was ready to serve, as this would have made the meringue slightly soggy on top. So despite the lack of height in my meringue peaks (sad times), it still looked and tasted fantastic!